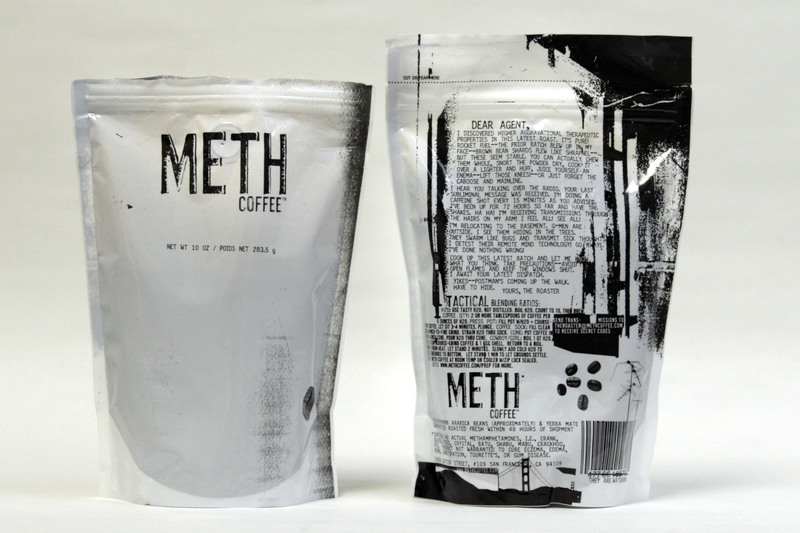 Meth Coffee – Dear Coffee, I Love You. I recently discovered this thanks to Mike Crimmin’s great review of it on Daily Shot of Coffee. As a designer, my first response is to call it a BS marketing scheme hoping to capitalize on the provocation this brand invokes. Like the Cocaine Energy drink, it rides on the back of drug references, but Meth Coffee take it a step further with the entire company shrouded in a seedy lab of mystery. Using the language of pushers and videos of meth head coffee junkies freebasing the product, it takes coffee to a place where I’ve never seen it before, which is itself an inspiring feat. Though I wouldn’t consider myself a part of the intended market—I find the drug references to be dopey—I’m sure there are enough college guys and metal heads to keep “The Roaster” in business. There’s only one blend and it’s laced with a bit of Yerba Mate for an extra caffeine kick. Mike gave its taste a fair review, but I’ve read elsewear that the Mate makes it a bit sour. Oh, and the State of Illinois banned it for glorifying drug culture.